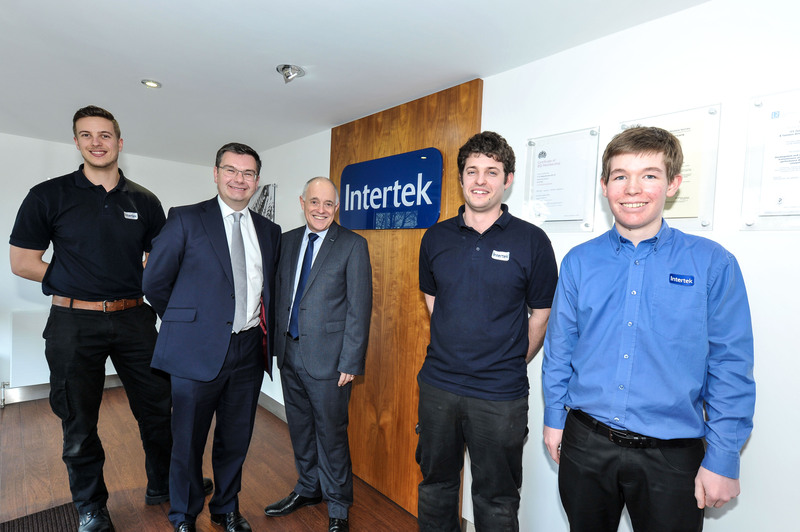 Iain Stewart MP joined Tony Braddon, Managing Director of Intertek, Milton Keynes, the leading UK engine test laboratory, and current trainees Jon Hotard, Jon Battlebury and Harry Tregartha to launch a recruitment drive encouraging trainees into an engineering and science career, testing the engines of the most exciting cars in the world. Owned by global quality solutions provider Intertek, this leading UK engine test laboratory has been providing automotive testing in Milton Keynes as Tickford for over 30 years and has a long and illustrious history going back to 1820’s in nearby Newport Pagnell. Today based in Blakelands, the company tests petrol, diesel and hybrid engines on behalf of leading vehicle manufacturers. Using recently installed state-of-the-art equipment, these tests include durability, performance and emissions development as well as testing the effectiveness of fuels and lubricants additives to meet UK and EU legislated and industry environmental standards. “It is an exciting time in the vehicle testing business as manufacturers worldwide respond to the current demand for improved engine performance, fuel and emissions efficiency, more stringent EU regulations and the growth of hybrid, electric and other engine technologies. At Intertek, we continue to invest in some of the best equipment in the world to make sure we continue to support the best manufacturers in the world,” said Tony Braddon, MD, Intertek. “Two of the current directors of the company began their careers as trainees here and we believe that this is the best way to learn about this fascinating but complicated business. We are looking for four new trainees this year and we hope they will start a career that will last as long as ours” Tony added.